Was there recriticality at Fukushima Dai-ichi Nuclear Plant? Criticality is a state in which nuclear fission reaction is occurring continuously in nuclear fuel. Nuclear fission generates a large amount of radiation and thermal energy. By artificially generating and controlling critical condition, nuclear power plants create thermal energy to produce electric power. 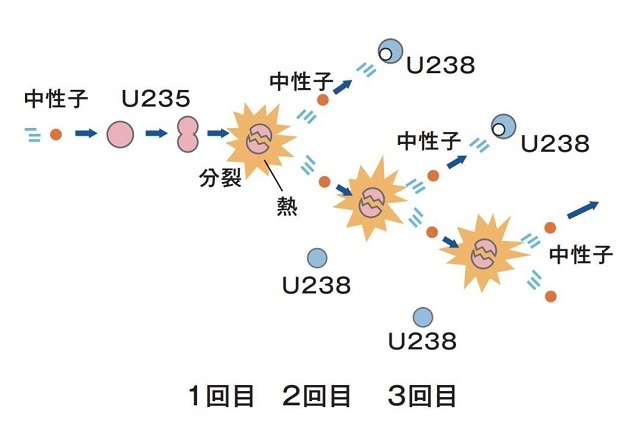 In the course of the nuclear accident at Fukushima Daiichi Nuclear Power Plant, nuclear fuels inside the reactors of Unit 1 to 3 melted down and the debris is scattered at the bottom or outside below the reactor pressure vessels. In the accident, intense heat of the molten fuel melted the vessels and the fuel fell through the holes. Molten fuel solidified as abundant water was poured in and has been cooled by flowing water ever since. Is there any possibility that this molten fuel (fuel debris) will become critical again? To judge this, measurement of “radioactive noble gas” such as Xenon plays a big role. Radioactive noble gas is an important indicator of the presence of criticality for it is created in fission reaction. Gas discharged from the containment vessel which covers the pressure vessel is closely monitored by the “gas management system.” The system analyses the kind and amount of each component in real time. Should there were any recriticality, radiation level of radioactive noble gases would increase indicating the presence of the state of criticality. The radioactivity level of radioactive noble gas at Fukushima Daiichi Nuclear Power Plant so far has been maintained at a very low level that is incomparable to what was observed in the critical state of the accident. It has never increased as to show critical signs up until now. This signifies the nuclear fuel once melted in the accident is kept in stable condition (maintained in subcritical state). Temperature of the now-defunct nuclear reactor in which molten nuclear fuel is cooled is also measured in real time. It is about the same as the outside temperature or a little colder (around 15 to 30 degrees). This means heat accompanying criticality is not only generated but also the amount of heat emitted by the decay of radioactive materials is very small. As a safety measure, equipments to inject boric acid water to halt the chain reaction of nuclear fission are installed in case re-criticality occurs.